If you’re one of the people who pay attention to these things, you know what’s happening, but for the rest of you, time is slipping away for Britain’s ruling Conservative party to figure out a deal with Europe for “Brexit” — a.k.a. the country’s withdrawal from the European Union. A potential deal was voted down this week in Parliament, but while on Wednesday Prime Minister Theresa May barely avoided a vote of no confidence that could have forced new elections, Brexit is happening deal or no deal on March 29. Which could have disastrous economic consequences. Yikes! 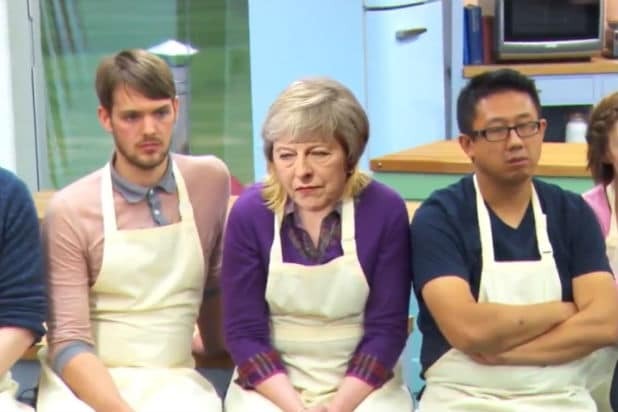 Enter a clever little video mashing up the Brexit mess with “Bake Off.” In the clip, we see footage of the show’s judges brutally explaining why a contestant’s entry failed spectacularly. Only, the contestant’s face has been swapped out digitally with that of PM May’s from recent remarks she made insisting her government is definitely going to deliver Brexit. It’s funny stuff, and you can watch it below.